Presented by COVER TECH OF IDAHO. Ten days ago after the Air Force game, a smiling Boise State linebacker Riley Whimpey had been mobbed by a group of Academy cadets chanting “We want Whimpey” in a show of respect after the Broncos’ victory over the Falcons. One week later as Boise State’s thriller against BYU was ending, Whimpey was in the Bleymaier Football Center nursing a torn ACL that’s going to keep him out for the rest of the season. It’s another impactful loss for the Bronco defense, as Whimpey had not only come into his own at Leighton Vander Esch’s old spot, he was a heart-and-soul guy on that unit. Whimpey is Boise State’s leading tackler with 55 stops, 36 of them in the past four games. He’s going to be missed as the Broncos go into this Friday night’s battle for the Milk Can as a three-point underdog to No. 16 Fresno State. Boise State has to delve deeper into the depth chart now. And the key to this predicament may be a player who wasn’t even on that sheet at the beginning of the season. Zeke Noa has been seeing more playing time since becoming healthy, making four tackles at Air Force. Noa missed the first three games of the season after undergoing an undisclosed surgery in late August. The 5-11, 243-pounder was a strong candidate to play as a true freshman last year but missed the entire season due to a knee injury suffered in fall camp. Now Noa will have to be ready for prime time. Another ‘backer who could be a factor is Tony Lashley, the graduate transfer from Idaho. Lashley’s playing time increased versus BYU—he had three tackles, including one for loss. This is almost taken for granted these days, but it shouldn’t be. The win over BYU Saturday night clinched a 21st consecutive winning season for Boise State. That is rarified air. Take the AP top 10, for example. Oklahoma has 20 straight winning seasons, LSU 19, Alabama 12, Clemson and Georgia eight, Ohio State seven, Washington State and West Virginia five, Michigan four, and Notre Dame two. And this is a factoid worth mentioning every autumn: in 51 seasons now as a four-year program, Boise State has had only five losing seasons. The Broncos have had 23 10-win seasons in that time. A 24th is touch-and-go right now with Fresno State and Utah State set to visit, but that’s why they play the games. The Boise State-BYU game buried some other football doings over the weekend. So today we catch up on Bronco commits for the 2019 recruiting class, because there are two new ones. Boise State has a second quarterback to go with four-star prospect Hank Bachmeier, Kaiden Bennett of Folsom, CA. Bennett is a dual-threat QB who also had offers that included Utah, San Diego State and Cincinnati. Like Bachmeier, Bennett can graduate early and enroll at Boise State in January. Wide receiver Khyheem Waleed of Queen Creek, AZ, is also aboard. Waleed was up for the BYU game and chose the Bronco offer over 14 other ones, including Oregon, Michigan State and Iowa State. Waleed does say he’s going to visit Indiana next month, so there’s always that seed of doubt. On the Monday Night Football telecast last night they called them “D-Law and the Boise State Bookends.” Will it stick? Maybe, maybe not. DeMarcus Lawrence, Tyrone Crawford. Leighton Vander Esch and the rest of the Cowboys were outmaneuvered by the Tennessee Titans offense 28-14 in Jerry’s World. Vander Esch, with Sean Lee hobbled again by a hamstring problem, tied for the team lead with nine tackles and Lawrence and Crawford had a sack apiece. “Tank” also forced a fumble recovered by the Cowboys. But all in all, Dallas did not have the look of a playoff contender. Kamalei Correa, incidentally, made three tackles for the Titans. You can’t draw too many conclusions from an exhibition, and that’s a good thing for Boise State, considering it was still a single-digit game midway through the second half. The Broncos eventually pulled away from Vanguard 89-63 last night in Taco Bell Arena. Coach Leon Rice used his bench liberally, with the exception of junior guard Justinian Jessup, who was held out. So here are things to file away—and check on later to see if they’re significant. Zach Haney got most of the post minutes and responded with a team-high 21 points and eight rebounds. Among the new faces, junior college transfer RJ Williams was all over the place with 16 points and eight boards, but he had six turnovers. And Derrick Alston put up 11 points and eight rebounds. Now that Oregon State has Destiny Slocum active, the Beavers shall not go unnoticed in the AP Women’s Basketball Poll in these parts. OSU came in at No. 8 last week, and Slocum was named Preseason All-Pac 12. Ironically, the former Mountain View High star faced a team she’s familiar with in Oregon State’s first exhibition game Saturday in Corvallis. In the Beavers’ 95-58 victory over Northwest Nazarene, Slocum scored 13 points with seven assists and four steals. It was her first taste of live action since the 2017 Women’s NCAA Tournament, after which she announced her transfer from Maryland. She had earned Big Ten Freshman of the Year honors with the Terrapins. Back to football—a five-game College of Idaho winning streak after an 0-5 start has earned the attention of NAIA Poll voters. The last four of the victories were over ranked teams, and now the Coyotes are one. For the first time in program history, the Yotes have cracked the Top 25 at No. 24 going into the final game of the season. C of I has also nabbed another NAIA National Player of the Week. This time it’s on special teams, as Kyle Mitchell was honored after booting a school-record 45-yard field goal to account for the winning points in the Yotes’ 17-14 win at Montana Western. Up north, Idaho safety Jalen Hoover has been named Big Sky Special Teams Player of the Week after blocking a punt that was returned for a touchdown as the Vandals rallied from 10 points down to beat North Dakota 31-27. And down southeast, Idaho State has earned its first ranking since 2015, coming in at No. 24 in the FCS Media Poll and No. 25 in the Coaches Poll. The Bengals are 6-3. This Day In Sports…brought to you by COMMERCIAL TIRE…keeping you and your family on the road. November 6, 1904: The kicking game back then was a little different than in, say, this year’s Boise State-Oklahoma State matchup. During the first quarter of a game against Oklahoma, the Cowboys are forced to punt from their own one-yard-line. The punt, into gale-force winds, was blown 15 yards back over the punter’s head into Cottonwood Creek. Oklahoma halfback Ed Cook retrieved the ball and swam upstream to score the game’s first touchdown, and the Sooners went on to rout Oklahoma State, 75-0. 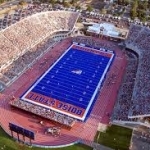 What does the BLUE TURF mean to you? What, Who Is Missing From Boise State Fundraising? I didn’t have real high expectations for the Masters. I was lucky to be invited by an old friend who may be fulfilling his own bucket list by giving people he knows a chance to experience the Masters. All I had to do was find my way to Atlanta. Idaho’s only professional hockey team has reached the playoffs 22 consecutive seasons — every year of its existence. The streak is tied with the Spurs of the NBA for the longest in North American pro sports.